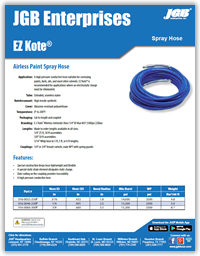 EZ Kote® Paint Spray Hose - JGB Private Brand - Hose by Vendor - JGB Enterprises, Inc.
A high pressure conductive hose suitable for conveying paints, fuels, oils, and most other solvents. EZ Kote™ is recommended for applications where an electrostatic charge must be eliminated. Cut to length and coupled. 1/4" or 3/8" female swivels; male NPT with spring guards. Made to order lengths available in all sizes. 1/4" 25 ft, 50 ft assemblies. 3/16" Whip hose in 3 ft, 5 ft, or 6 ft lengths. Special construction keeps hose lightweight and flexible. A special static drain element dissipates static charge. Date coding on the coupling provides traceability.